Canadian entrepreneurs might feel like a beaten boxer that can’t get up off the stool for the last round of the fight, but now there’s a Dragon that’s willing to help them win. Croxon’s goal to raise a minimum of $100 million by this Fall. Investors are being asked to kick in enough money that “they’ll have incentive to pick up the phone when it rings” and startups receiving funding will get it in pieces of between $1 and $5 million. 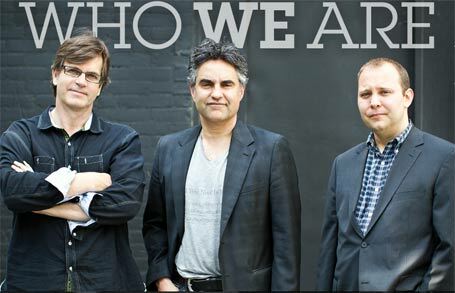 From left to right: John Eckert, Bruce Croxon, and Scott Pelton of Round 13 Capital. It will go to tech startups seeking series A financing, firms that have proven their concept and are ready to scale up to larger revenues. Croxon, the managing partner of Round 13, announced his plans today at an event in Toronto. Croxon has partnered with two other venture capitalists for Round 13. Scott Pelton has invested in Fixmo, BumpTop, Datawire and Sysomos. John Eckert co-founded McLean Watson Capital, the majority investor in i4i, which won an prolonged court battle with Microsoft Corp. over patent infringement regarding the use of XML in Microsoft Word. The trio of venture capitalists are about a quarter of the way to reaching their fundraising goal, Eckert says. But he can’t reveal who’s committed to invest yet. The strategy for its next steps are to approach corporate markets and institutions for investments. Round13 will also be backed by a founders board, composed of entrepreneurs that have started companies and either sold them, or exited with a public stock offering. The board includes the founders of CognoVision, which sold to Intel Corp., Ray Reddy, the founder of Pushlife which sold to Google, and Nick Koudas, the founder of Sysomos, which sold to Marketwire. Round 13 is looking to fill the gap between the talented technology entrepreneurs in Canada and the amount of venture capital available to help them grow, Croxon says. He points to the seed funding area of the market becoming more robust with incubators like the Ryerson Digital Media Zone, Extreme Startups, and MaRS’ Jolt offering some initial funding to startups. But what happens to entrepreneurs after that? With the press launch, Croxon says he hopes to attract the attention of institutional investors. His goal is to become the go-to place for growth stage investing in Canada. Brian Jackson is the Associate Editor at ITBusiness.ca. E-mail him at bjackson@itbusiness.ca, follow him on Twitter, connect on Google+, read his blog, and check out the IT Business Facebook Page.